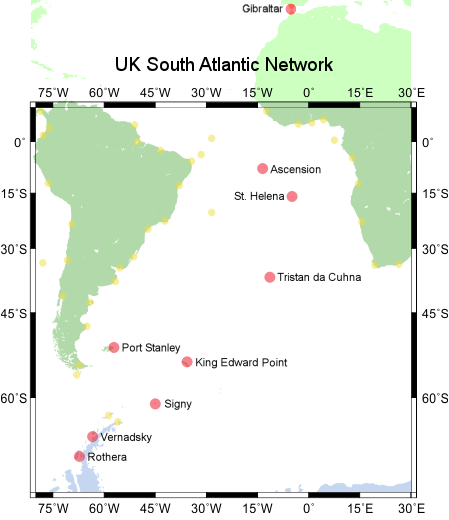 The UK South Atlantic sea level network consists of tide gauges of various kinds at South Atlantic islands, Gibraltar and stations in Antarctica. The network originated from a National Oceanography Centre research programme in the 1990s called ACCLAIM. The UK South Atlantic sea level network forms part of the UK's commitment to the Global Sea Level Observing System (GLOSS) of the Intergovernmental Oceanographic Commission (IOC), the other part of that commitment being gauges in the UK itself. Delayed-mode data from the network from its Phases 1 and 2, and Phase 1 Radar are available as are precise positions and local maps of most stations. In Phase 1 of ACCLAIM from 1983, measurements at coastal tide gauge sites took the form of sub-surface pressure (SSP) measurements (units of pressure, e.g., mbar) rather than sea level (units of length, e.g., centimetres). SSP is here defined as the total, measured pressure recorded by a sub-surface pressure transducer, a measurement which includes the pressure load from the atmosphere as well as from the water column. It is absolutely essential that any user of ACCLAIM data realises which data type (either SSP or sea level) is being analysed. The Phase 1 coastal SSP data were acquired in different ways (e.g., with a diver-replaced Aanderaa pressure gauge at Ascension, or with a Digiquartz in the sea sensor at St. Helena, see Spencer et al., 1993 for details) and with different pressure integration periods (e.g., quarter hour, half hour, one hour). For some data sets, the original data have been filtered to give one hour sampling. However, common to all records is an uncertainty connected with potential offset biases and drifts in the pressure sensors. The drifts mean that in most cases the records should not be used, without further careful attention in particular studies, for the study of timescales seasonal or longer. From around early 1993, the gauges at several sites were replaced by 'B gauges' which record SSP, air pressure and sea level as described in: Woodworth, P.L., Vassie, J.M., Spencer, R. and Smith, D.E., 1996. Precise datum control for pressure tide gauges. Marine Geodesy, 19(1), 1–20. These gauges have precise datum control and are used to provide long term sea level change data to the PSMSL. More recently, radar tide gauges delivering data with known datum have been used to provide sea level data that have also been contributed to the PSMSL. These sets of sea level data were obtained by radar gauges which we believe can be considered as providing a continuous time series to the same datum (as we have no reason to believe that the radar information contains an instrumental drift), but for which we do not know the actual datum with respect to land benchmarks, as required for Phase 2 data. It is possible that eventually some of the Phase 1 Radar data may be 'promoted' to Phase 2 when additional datum information (e.g., as provided by simultaneous tide pole measurements) become available. Some Phase 1, some Phase 1 Radar and all Phase 2 coastal data will contain ancillary information on air pressures and sea temperatures from various sensors. Spencer, R., Foden, P.R., McGarry, C., Harrison, A.J., Vassie, J.M., Baker, T.F., Smithson, M.J., Harangozo, S.A. and Woodworth, P.L., 1993. The ACCLAIM programme in the South Atlantic and Southern Oceans. International Hydrographic Review, 70, 7–21. Woodworth, P.L., Pugh, D.T., Meredith, M.P. and Blackman, D.L., 2005. Sea level changes at Port Stanley, Falkland Islands. Journal of Geophysical Research, Vol. 110, C06013, doi:10.1029/2004JC002648. Woodworth, P.L., Pugh, D.T. and Bingley, R.M., 2010. Long term and recent changes in sea level in the Falkland Islands. Journal of Geophysical Research, 115, C09025, doi:10.1029/2010JC006113. Woodworth, P.L., Foden, P.R., Jones, D.S., Pugh, J., Holgate, S.J., Hibbert, A., Blackman, D.L., Bellingham, C.R., Roussenov, V.M. and Williams, R.G., 2012. Sea level changes at Ascension Island in the last half century. African Journal of Marine Science, 34, 443–452, doi:10.2989/1814232X.2012.689623. See also the Permanent Service for Mean Sea Level web page on the UK South Atlantic network. For further information, please contact Dr Angela Hibbert (anhi@noc.ac.uk). Other real time pages are available for NOC engineers only.